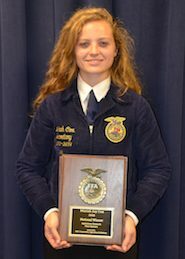 Winners of the 2016 National Agricultural Proficiency Awards were announced during the sixth general session at the 89th National FFA Convention & Expo. These awards honor FFA members who, through their Supervised Agricultural Experience (SAE) programs, have developed specialized skills that they can apply toward their future careers. Our two coverage sponsors also sponsored proficiency award categories to further their commitment to youth in agriculture. New Holland Agriculture sponsored the Dairy Production — Entrepreneurship proficiency and it was awarded to Sabrina L. Portner from the Sleepy Eye FFA Chapter in Minnesota. Sabrina raises and breeds her own dairy cattle. Receiving her first calf when she was 7, she currently owns a herd of 27 registered Brown Swiss cattle. She has used pedometers to increase heat observations and has conducted a milk quality research project with her herd that has allowed her to discover which mastitis organisms are affecting her cows. Portner is supported by her parents, Mary and Tom, and her FFA advisor, Mary Hoffman. 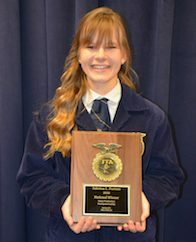 FMC Corporation, Agricultural Solutions sponsored the Agriscience Research — Plant Systems proficiency and it was awarded to Mariah Joy Cox from the Zane Trace FFA Chapter in Chillicothe, Ohio. Mariah has participated in science fairs since the fourth grade and found that she enjoyed the scientific research process and sharing her results with the judges. Her SAE research has focused on three projects, all related to plant science. She first identified properties of potato starch and their applications to plant-based packaging. Secondly, she compared two varieties of raspberries in terms of phenolics and anthocyanins. And finally, she worked in a lab in Hyberabad, India, testing plots of vegetable soybeans. Cox is supported by her parents, Rachel and Paul, and her FFA advisors, Jennifer Johnston and Aaron Miller.